Ontario’s roads, especially in the winter months, can be very dangerous for drivers, passengers, and pedestrians. Thousands of people are hurt as a result of car accidents every year and nobody is ever truly ready to deal with a serious automobile accident. Even fewer people are aware of their rights under their insurance policy or under the Insurance Act. There are a number of different sources for compensation after a car accident. Compensation is available through the insurer of the at fault driver and through the injured person’s own insurance company, regardless of who’s at fault. It’s important to talk to an experienced and knowledgeable lawyer who can guide you through your options. Our office has a proven history of success against insurance companies. Our office will work to ensure that you receive fair compensation. We work side-by-side with victims and their families to help them understand the car accident claims process. Contact our office for a free, no obligation consultation. When you get involved in a car accident but no one has been injured and the damage is minor, it is not always necessary to call the police. Depending on the case and situation, some police would prefer you did not call them because they don’t have time and resources to deal with it. In this case of minor accidents, we advise to exchange all pertinent information with the other drivers and call your insurance company first. Try to stay calm, keep yourself and others safe. If you can’t get out of your car, turn on your hazard lights. If anyone is seriously (or minor) injured, call 911. Visually scan the accident scene and make sure that you are not in danger of being hit by another vehicle. Exchange information with the other drivers involved. Get their names, addresses, phone numbers, license information, insurance company name and policy number. Try to obtain the contact information of any witnesses who are at the scene. Try to move anyone who is injured – wait for medical help to arrive! Never accept a direct offer of payment for any damage from the other driver or people involved. If you’re not at fault, the accident will not affect your driving record nor will you have to pay a deductible. Never sign any documents other than the police report. 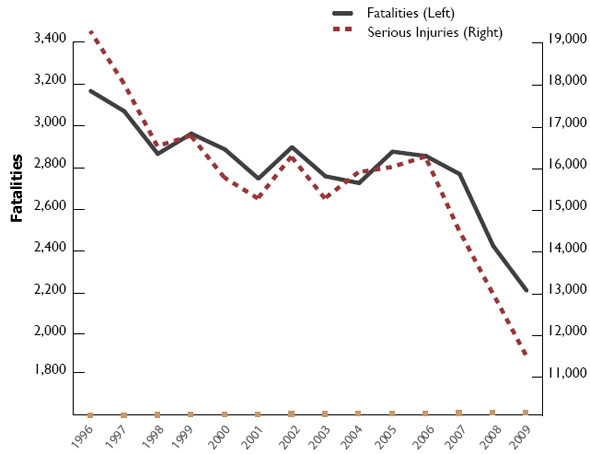 According to transport Canada latest research in 2009, there were 2,209 fatalities and 11,451 serious injuries (requiring hospitalization over night), representing a decline of 25% in both measures compared to the period from 1996 to 2001. From 2004 to 2008, about three-quarters of fatalities and 70% of serious injuries have been drivers or passengers of vehicles. Although drivers aged between 15 to 34 represent only about 30% of the driving population, they accounted for 40% of the fatalities and 45% of the serious injuries, indicating that younger drivers are at greater risk. About two-thirds of fatal collisions and 30% of injury crashes occur on rural roads, typically undivided with two lanes (Transport Canada and CCMTA, 2011). The annual social costs of the motor vehicle collisions in terms of loss of life, medical treatment, rehabilitation, lost productivity, and property damage are measured in tens of billions of dollars.